Inpatient Hospitalization in Addiction Treatment for Patients with a History of Suicide Attempt: A Case of Support for Treatment Performance Measures � Joseph E. Glass, M.S.W. ; Mark A. Ilgen, Ph.D.; Jamie J. Winters, Ph.D.; Regan L. Murray, Ph.D.; Brian E. Perron, Ph.D. & Stephen T. Chermack, Ph.D.
Drug Use and Conflict in Inner-City African-American Relationships in the 2000s �Andrew Golub, Ph.D.; Eloise Dunlap, Ph.D. & Ellen Benoit, Ph.D.
Heroin-Dependent Inmates� Experiences with Buprenorphine or Methadone Maintenance � Ezechukwu Awgu, Ph.D. Candidate; Stephen Magura, Ph.D., C.S.W. & Andrew Rosenblum, Ph.D.
Urine Testing During Treatment Predicts Cocaine Abstinence �Emilio S�nchez-Herv�s, Ph.D.; Francisco Zacar�s Romaguera, M.A. ; Francisco Jos� Santonja G�mez, Ph.D.; Roberto Secades-Villa, Ph.D.; Olaya Garc�a-Rodr�guez, Ph.D. & Elena Mart�n Yanez, M.A. Prospective Predictors of Premature Death: Evidence from the National Longitudinal Study of Adolescent Health � William Feigelman, Ph.D. & Bernard S. Gorman, Ph.D. The Meaning of Suffering in Drug Addiction and Recovery from the Perspective of Existentialism, Buddhism and the 12-Step Program �Gila Chen, Ph.D.
�Tweaking and Geeking, Just Having Some Fun�: An Analysis of Methamphetamine Poems �Rocky L. Sexton, Ph.D.; Robert G. Carlson, Ph.D.; Carl G. Leukefeld, Ph. D. & Brenda M. Booth, Ph.D. 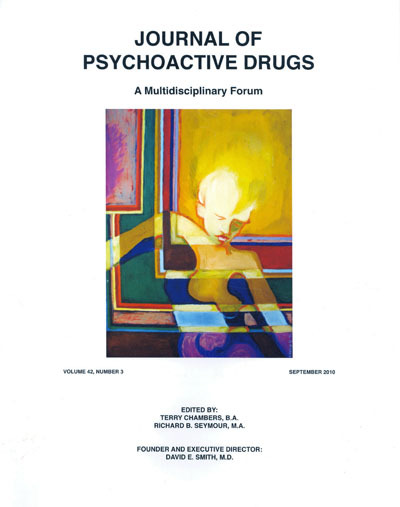 Influence of Age on Salvia Divinorum Use: Results of an Internet Survey �Pearl P. Nyi, Pharm.D. ; Emily P. Lai, Pharm.D. ; Diana Y. Lee, Pharm.D. ; Shannon A. Biglete, Pharm.D. ; Gilsky I. Torrecer, Pharm.D. & Ilene B. Anderson, Pharm.D. Adolescent Marijuana Users � Alecia D. Schweinsburg, Ph.D.; Brian C. Schweinsburg, Ph.D.; Krista Lisdahl Medina, Ph.D;Tim McQueeny, B.A. ; Sandra A. Brown, Ph.D. & Susan F. Tapert, Ph.D.
Abstract�This study attempts to validate substance use disorder (SUD) treatment performance measures (PM) in a naturalistic treatment setting. Despite its significance in healthcare systems and in SUD populations, suicidality is one patient characteristic that remains unexplored in the context of SUD PMs. The current study focused on the extent to which the care processes encouraged by SUD PMs were associated with improved outcomes in patients with a prior suicide attempt as compared to those without. We abstracted Addiction Severity Index and health services data from the VA medical record for 381 veterans who initiated outpatient SUD treatment and completed baseline intake measures at a Midwestern VA hospital. Cox proportional hazard regressions examined how baseline characteristics, prior suicide attempts, and PM status predicted the time until hospitalization for psychiatric or substance use problems. Prior suicide attempts significantly interacted with treatment engagement, and hospitalization risk was significantly higher among individuals with a prior suicide attempt who did not meet PMs. This study provides initial observational evidence that past suicide attempts may be a factor that should be considered when defining performance standards that influence the processes of SUD treatment. Future research on PMs should take into account the differences on indicators of high risk and poor treatment outcomes. Abstract�Inner-city relationships face numerous challenges including illegal drug use and its consequences. The nature of this challenge, however, has changed dramatically with a shift from the crack subculture of the 1980s and early 1990s to the subsequent marijuana/blunts subculture. This study presents data concerning 95 inner-city relationships where illegal drug use was present from people who were interviewed in 2004-2006 and reinterviewed in 2008. Hard drug use was still problematic in the 2000s even with the passing of the crack epidemic and its associated behavioral norms. Hard drug (primarily crack) users reported drug use was a problem, reported conflict over drugs, reported higher levels of conflict than others and were the most likely to have broken up with their partner. On the other hand, the experiences and subcultural norms associated with marijuana use appeared to be much less detrimental to relationship harmony. Subjects who used marijuana but not hard drugs reported much less relationship conflict. Indeed, many reported that they enjoyed using marijuana with their partner. These subcultural insights further the understanding that young adults have constructed a much more socially productive subculture regarding marijuana use than their predecessors had constructed around use of crack. Abstract�Methadone and buprenorphine are both efficacious treatments for opioid dependency, but they also have different pharmacological properties and clinical delivery methods that can affect their acceptability to patients. This study was intended to increase our knowledge of heroin-dependent individuals� perceptions of methadone vs. buprenorphine maintenance based on actual experiences with each. The study sample consists of heroin-dependent men at the Rikers Island jail in New York City who were voluntarily randomly assigned to methadone or buprenorphine maintenance in jail. Methadone patients were more likely to report feeling uncomfortable the first few days, having side/withdrawal effects during treatment, and being concerned about continued dependency on medication after release. In contrast, buprenorphine patients� main issue was the bitter taste. All of the buprenorphine patients stated that they would recommend the medication to others, with almost all preferring it to methadone. Ninety-three percent of buprenorphine vs. 44% of methadone patients intended to enroll in those respective treatments after release, with an added one-quarter of the methadone patients intending to enroll in buprenorphine instead. These results reinforce the importance of increasing access to buprenorphine treatment in the community for indigent heroin-dependent offenders. Urine Testing During Treatment Predicts Cocaine Abstinence � Emilio S�nchez-Herv�s, Ph.D.; Francisco Zacar�s Romaguera, M.A. ; Francisco Jos� Santonja G�mez, Ph.D.; Roberto Secades-Villa, Ph.D.; Olaya Garc�a-Rodr�guez, Ph.D. & Elena Mart�n Yanez, M.A. Abstract�The objective of this study was to analyze the influence of the variables that predict cocaine abstinence on an outpatient program for the treatment of addiction to this substance. Participants were 80 patients (85% men and 15% women) selected at random from those receiving treatment at a Spanish health service outpatient unit. For detecting the predictor variables the authors carried out a chi-square automatic interaction detection (CHAID) analysis. Logistic regression analysis and discriminant analysis were performed to estimate the probability of abstinence according to/using the predictor variables detected by CHAID analysis. Abstinence rate after six months of treatment was 37.5%. The variable that best predicted abstinence was number of urine tests carried out over the course of treatment. The rest of the variables used did not have statistically significant influence. The mathematical model used correctly classified 80% of cases. A total of 31 tests were necessary for a probability of over 0.75 of being abstinent at six months. Regular screening for abstinence by means of objective tests helps to improve abstinence rates on cocaine-addiction treatment programs. Abstract�This study was based on data from the National Longitudinal Study of Adolescent Health (Add Health), which revealed that 96 of its original Wave I respondents died prior to the collection of the Wave III survey. We compared psychosocial and behavioral characteristics reported at Wave I among those who died and those who lived (n = 16,719) using chi-square tests, t-tests, and logistic regression analyses to determine the most important risk factors for premature death among adolescents and young adults. Results suggested that driving while drunk was the most important risk factor for premature death (adjusted odds ratio = 2.48; 95% confidence interval: 1.12�5.50). The prevalence of driving while drunk was 17.7% among decedents compared with 6.4% among the survivors. Decedents were also significantly more likely to report multiple risk behaviors than survivors. As the current study demonstrates the importance of alcohol use as a contributing factor to the three leading causes of youth deaths, renewed efforts are needed to prevent and reduce alcohol consumption and abuse among this vulnerable population. Abstract�The aim of the current article was to examine the meaning of suffering in drug addiction and in the recovery process. Negative emotions may cause primary suffering that can drive an individual toward substance abuse. At the same time, drugs only provide temporary relief, and over time, the pathological effects of the addiction worsen causing secondary suffering, which is a motivation for treatment. The 12-Step program offers a practical way to cope with suffering through a process of surrender. The act of surrender sets in motion a conversion experience, which involves a self-change including reorganization of one�s identity and meaning in life. This article is another step toward understanding one of the several factors that contribute to the addict�s motivation for treatment. This knowledge may be helpful for tailoring treatment that addresses suffering as a factor that initiates treatment motivation and, in turn, treatment success. Abstract�There is a body of methamphetamine-themed poetry that speaks regretfully of the highly negative experiences of those in recovery from methamphetamine (MA) addiction or who feel trapped in an MA-using lifestyle. During ethnographic research in western Kentucky, the author collected two MA-themed poems from active MA users that differ from other MA poetry. They describe misadventures that occur during MA �binges.� However, the text and tone of the poems are comically ironic and represent optimism rather than regret toward MA use. Analyzing these poems provides valuable insights into local patterns of MA use, related terminology, and attitudes toward MA use. Abstract� An Internet-based survey of Salvia divinorum (�salvia�) users was conducted to identify correlates surrounding its use. Salvia-knowledgeable persons were recruited via �social networking Internet websites� (n = 23) where notices were posted on recreational salvia group message boards (n = 69). Data collection included demographics, use circumstances, experiences, and age (current and at first salvia use). A total of 219 surveys were analyzed. Salvia users who were young adults (≤21yrs) at first use favored salvia for fun (OR = 1.94, CI = 1.08-3.49, p = 0.03) or to relieve boredom (OR = 2.06 CI = 1.09-3.91, p = 0.02), while salvia users who were adults (≥22yrs) at first use favored salvia for spiritual effects (OR = 2.63, CI = 1.02-6.75, p = 0.04). Being an adult at first use was associated with higher odds of concurrent marijuana (OR = 2.68, CI = 1.50-4.78, p = 0.0007) or tobacco use (OR = 1.94, CI = 1.05-3.60, p = 0.03). Over half of all respondents reported use reduction or cessation in the past 12 months (114 of 219, 52%), citing dislike of the high (33.3%) or loss of interest in salvia (28.9%). Reports of cessation suggest salvia use may be more attributed to curiosity than continual abuse. Sexual Assault Perpetrators� Alcohol and Drug Use: The Likelihood of Concurrent Violence and Post-Sexual Assault Outcomes for Women Victims � No�l Bridget Busch-Armendariz, Ph.D.; Diana M. DiNitto, Ph.D.; Holly Bell, Ph.D. & Thomas Bohman, Ph.D.
Abstract� Addressing sexual assault requires policy and practice responses that are well-informed and empirically-grounded. This study examines the impact of perpetrators� drug and alcohol use during and after sexual assault. A representative sample of women, who responded to a random digit dialing survey, and reported that they were sexually assaulted at some time in their lives were utilized. The survey questions were drawn largely from The National Violence Against Women (NVAW) Survey (Tjaden 1996), and a series of binary logistic regressions was conducted to determine the impact of perpetrators� alcohol and drug use on violence before and after the assault. Findings indicate that perpetrators� alcohol or other drug use at the time of the assault resulted in a greater likelihood of concurrent violence, including hitting, slapping, kicking, use of a weapon, threats to harm or kill, and physical injury during the assault, and as a result, assault victims experienced more time lost from work, school, home duties, and recreation. Both these impacts occurred regardless of the relationship of the perpetrator to the victim, location of the sexual assault, or the victim�s ethnicity. This information assists advocates and policy makers in prevention efforts where sexual violence is more likely to emerge. Abstract�Some neurocognitive recovery occurs within a month of abstinence from heavy marijuana use, yet functional magnetic resonance imaging (fMRI) has revealed altered activation among recent and abstinent adult users. We compared fMRI response during a spatial working memory (SWM) task between adolescent marijuana users with brief and sustained durations of abstinence. Participants were 13 recent users (two to seven days abstinent), 13 abstinent users (27 to 60 days abstinent), and 18 nonusing controls, all ages 15 to 18. Groups were similar on demographics, had no psychiatric or medical disorders, and user groups were similar on substance histories. Teens performed a two-back SWM task during fMRI. Recent users showed greater fMRI response in medial and left superior prefrontal cortices, as well as bilateral insula. Abstinent users had increased response in the right precentral gyrus (clusters ≥1328 �l, p < .05). Results suggest that adolescents who recently used marijuana show increased brain activity in regions associated with working memory updating and inhibition. This study preliminarily suggests that (1) recent marijuana use may disrupt neural connections associated with SWM and result in compensatory brain response, and (2) sustained abstinence from marijuana may be associated with improvements in SWM response among adolescents.